While I can be very good at playing my cards close to the chest (well, to not give myself that much credit, I’ll say that it’s certain cards I’m very good at playing close to the chest)—to keep things hidden, private—it just seems to be an unshakeable, unchangeable part of my nature to be completely open and vulnerable with damn near anyone one I have the pleasure of interacting with. To bare me. Good, bad, and ugly. And another part of my nature that I just can’t seem to alter? It comes incredibly easier to bare the bad and the ugly of and in me—to convey and share all my faults—than it does for me to share what’s quote unquote, good (yes, I wrote out quote unquote rather than simply putting quotation marks. It was a stylistic choice to emphasize my point, and I have the freedom as a writer to use it, godammit.). That being said, for whatever reason that it’s so easy for me to share the bad and the ugly and all my faults and eccentricities—and beyond that, to share what I’ve learned from them, by them, and everything associated with them—I cannot for the life of me convey just what it’s like to be me. That is, to think how I think, feel how I feel, and struggle with what just what struggle life is like for me on a day in and day out basis. Perhaps that’s why I get so emotional when I come across any form of media on the internet where someone who shares in my…afflictions…my…struggles…my…daily challenges I constantly face with what feels like no sense of relief. My emotional reaction has nothing to do with a sense of camaraderie that I feel with these individuals. When I’m faced with an article, or a video, or some such piece of media that makes me bawl up and ball up, it doesn’t stem from a heartfelt thought that I’m “not alone in what I feel and struggle with,” (though I both don’t see anything wrong with that, and am truly encouraged that there are other individuals out there that share struggles with my own) no, I break down emotionally because I’m finally facing and hearing my struggles and my difficulties through words and conveyances with a clarity and articulation that I could never have expressed myself. Like some “out-of-body experience,” I’m witnessing everything I wish for people to know—no, to understand—about my struggles, expressed in such a way that makes such sense; in a way that I believe everyone, in whatever way they are related to me, can understand. In a way that just…clicks. In a way that I hope translates to a better, more rounded, and honestly—cards on the table, here—more sympathetic understanding of me as a whole. Which is why after seeing this latest video, I feel so inclined to share it. Lemmie back up a bit and give some background here first. 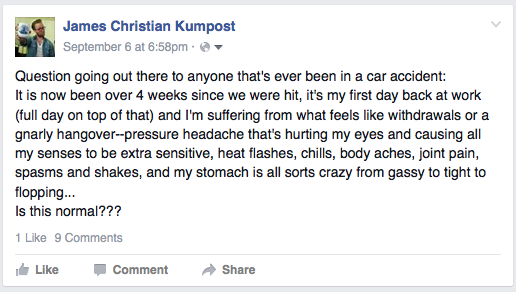 If you weren’t aware, I was involved in an auto accident on 13.August. My infant son and I were rear-ended by an F-150 going between 30-45mph while we were at a complete stop. On the surface, with both damage to the car, and injuries sustained, everything appeared rather minimal. We were able to drive ourselves to the ER to get checked out, and thankfully my son checked out just fine at the ER and has been since, suffering only a pretty good scare. And I, looked to have just sustained some whiplash, sprained wrist, hurt shoulder, and general other discomforts. Then came a couple days later. The car—drivable to this point, though the backside body was evidently damaged—suddenly ceased to start. Come to find out that the impact completely damaged the fuel pump (amongst other technical parts I don’t know or care to explain). I myself went for a followup appointment with Primary Care, where it was deduced that the force of the impact no doubt caused my shoulder to dislocate, and—more than that, the impact was great enough that the dislocation could (and did) possibly damaged the ligaments in my arm. Further, I had (have) sciatica in both legs, and back pain that just won’t quit. This was the initial diagnosis. All physical. Because I didn’t hit my head, nor did I ever lose consciousness during the accident. I was put on leave from work for three weeks so as to give my body time to heal. Flash forward to when I start work again. (And, I cannot emphasize this enough, this begins the heart of all of what I’m getting at.) I’m noticing all sorts of symptoms that I did not anticipate to be the case upon returning. And they don’t go away. And then I begin noticing more and more stuff that started to worry me. I forgot my wife’s phone number…consistently. I had trouble remembering a lot of things, in fact. And attempting to do so cause that pulsating pressure headache to flare up. I couldn’t do puzzles or math correctly, and if I focused too hard, that pulsating pressure headache would flare up again. Soooo…I schedule another appointment with Primary Care. This time addressing everything I’m feeling neurologically—which is affecting the rest of me physically. And after that, the diagnosis. Not only did I sustain a concussion from the accident, but I fall into a small category of concussive victims who get (or have) what’s called Post Concussive Syndrome. It’s convoluted, and I still don’t fully get it, but from what I was told, those with this diagnosis maintain the symptoms of a concussion for any given time-frame…indefinitely. If you’re confused as I was, my doc explained it this way: with the impact of the accident, the force was so strong that it not only caused my shoulder to dislocate, but in the process of dislocating, that force on my arm and shoulder damaged ligaments. It wasn’t as if my shoulder just popped out. It popped out with enough force to damage all the ligaments that attach it together. With that in mind, he then explained how that same force impacted my noggin. I may not have hit my head, but my head did fly forward with the same force that threw my shoulder out (hence the whiplash). And because I told the ER that I didn’t hit my head, nor lose consciousness, they didn’t check for any neurological damage. No…that’s the start of where I’m at. And that’s where I come back around to certain parts of the internet explaining things far better than I can. Because just where am I at? Well just tonight—at work—after a particularly difficult day physically, mentally, but especially emotionally, I came across this video. And after watching it, crying, wiping away tears so I could help customers, I came to the conclusion that this was the best any only way to share what’s going on. If you only watch through her description of Post Concussive Syndrome, and what it’s like, that’s good enough. I’m not looking for how best to “deal with” me in this condition. My goal is what I stated in the beginning of this post. Here’s the problem, I don’t just have Post Concussive Syndrome. That’s not the only neurological diagnoses that I’ve been given. I’ve been diagnosed with adult ADD—Attention Deficit Disorder. Lastly, I suffer from anxiety and panic attacks. Now this is one of those things that I tend to be able to hide pretty well…this is a set of cards I’m very good at playing close to the chest. But just because I don’t show it, does not mean that the emotional state is not there raging inside of me. For the most part, I think you can tell when my anxiety kicks up and I’m suffering a panic attack because certain “ticks” of my OCD go full throttle. here it is, two weeks of toughing it out working in an environment that is completely and utterly not conducive to my condition. Here I am—being told that the only remedy is rest, both physically and mentally—struggling to follow through with doctor’s orders. Because honestly, how can I. And I mean to genuinely ask: how can I? My mind is constantly racing from one thing and thought to another thanks to my ADD. There’s a lack of order EVERYWHERE which flares up my OCD. I’ve realized that not having things in the sense of order that I need makes my head ache and I get dizzy and feel light headed and nauseous now thanks to the Concussion symptoms. So now my OCD is in overdrive simply to keep my PCS symptoms at bay. All of this—the thoughts, the questions, the struggling with order and my own physical well being and people depending on me and needing to get better which means needing to rest but I can’t rest because I have so much that needs to get done and only I can do it and there’s no way out so there is no rest which means there won’t be recovery which means I’m stuck where I’m at indefinitely with no way out and no help out and all this pressure pressure pressure on me—all of it then flares up my anxiety and causes panic to kick in which then flares up my OCD more so then I need organization all while my ADD won’t let go of the thought that I need to just stop and get some rest but I can’t just go to sleep and I don’t know why which keeps me up even more which only exacerbates the lack of getting rest bit which then exacerbates the anxiety because I’m scared shitless about not being able to take care of myself and does anybody care? why would they? they have no reason to. and so is this why I’m writing this in hopes of giving reason to care, to look at me differently, to know, to understand, to sympathize with all of this struggle that’s bringing me to a Jack Kerouac style rant as tears fill my eyes and cause my glasses to fog up staring at a screen after 1am while my wife and son are asleep and all I want to do is go to bed but I can’t because I’m not sure if that’s at all what I really want or if all I really want is to be held and to know that it’s okay and I’m okay and all this pressure pressure pressure that I feel from EVERYONE whether they intend to or not is literally mixing me up so much inside that I can’t even convey what I feel besides sharing the videos and saying that now I’m thinking of the Eve 6 song, “Inside Out,” and all I want is to just be free to rest…truly rest…even if rest comes from oblivion, at least it would be rest, but I can’t rest. I can’t do anything right now but try to finish this post. Because every part of me feels like it is a necessity, every part of me feels like I have to. Maybe now…here, now, in this sentence, in this line, after everything that just came before, THIS is where I’m truly at. And I don’t really know what my goal in writing this is anymore. I know what I initially sought. I said it in the beginning: understanding…perhaps compassion…sympathy. But right now? Now I don’t know. Perhaps you can tell me. What was the point. For now, now I have finally come to the end (of this at least). And it’s time to lay down in my bed and hope and see—just hope and see—if I can truly get some rest. Love you Christian. Im so sorry for the pain you’re in right now, both physical and emotional. Is there anything I can do for you besides pray?